When Irene and Sandy devastated homes in West Haven, Connecticut, a program helped some residents move to higher ground. Damaged home in West Haven after tropical storm Irene. Photo: Courtesy of David McCarthy. Tropical storm Irene devastated homes in a low-lying neighborhood of West Haven, Connecticut. 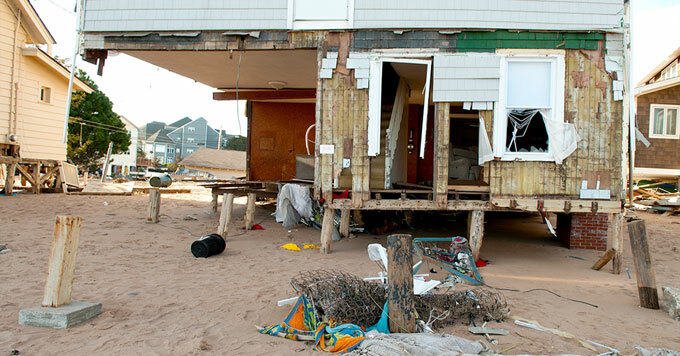 A year later, Superstorm Sandy did the same. Residents knew it was only a matter of time before they got flooded again. Mark Paine, with West Haven’s Department of Public Works, says continuing to rebuild in that area no longer made financial sense. So the city turned to a federal flood-plain easement program. The houses are removed, and the property gets put into an easement so it can never be developed. Then, the city and federal partners restore the land to marshland habitat, which can absorb floodwater. It’s a hard decision to leave a home behind. But for the few dozen homeowners who have opted in, the program offers an affordable way to move to higher ground. And the land they leave behind will help strengthen the city to withstand future storms.